The heart of an effective sustainment management system is a set of processes to ensure sustainment risks are identified, defined, and prioritized. In the process of this evaluation, each risk is also considered for the likelihood the risk will be realized and the impact to the mission, if realized. The evaluation must also consider the lead time to fix the issue versus the lead time available. The illustration above is one way of addressing these factors. 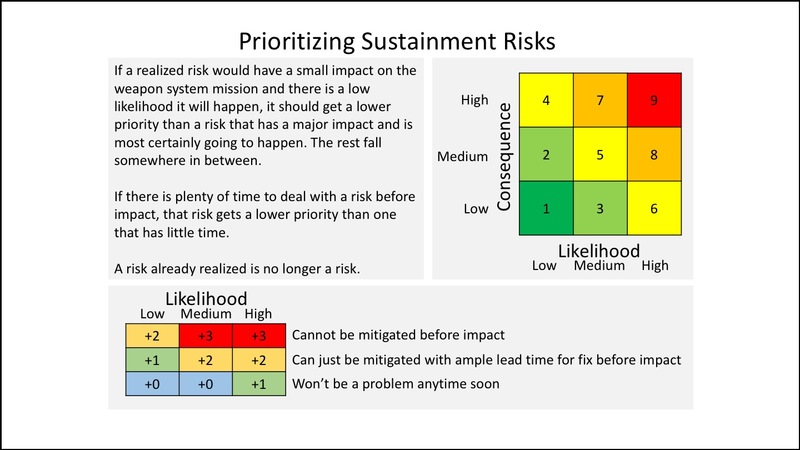 The 9 numbers in the upper right matrix give you a quick way to prioritize your list of risks. The numbers in the lower left matrix give you a convenient way to up the priority. However, most of this is negotiable. Many seem to favor a 5 x 5 matrix of consequence vs. likelihood. The priority numbers in both matrices can be arranged in whatever order makes the most sense. The amount of higher priority a risk is given based on lead time could be set as specific calendar time instead of comparing lead times. Many other variations are possible, but must be agreed to and set forth in clear instructions. And always remember, these are tools for your convenience. For instance, once a risk is initially prioritized, the list may be manipulated to change priorities for any good reason.